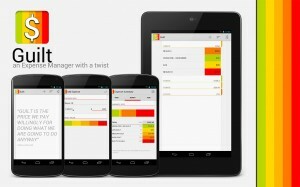 We’ve got a new App on the Market: Guilt, an Expense Manager with a twist. With Guilt you can keep an eye on your Expenses in simple and funny way! With a simple and colorful design, Guilt is perfect to all those who want to keep a track of how much money they spent and where they spent it, even the ones who don’t like expense managers. Unlike other expense managers on the market, Guilt uses a “twist” to help you keep an habit of writing down your expenses: instead of adding your expense with boring categories, add your expense by the Guilt that the expense makes you feel. After writing down your expenses, you can see how you’re spending your money during the Week, Month and Year. Guilt is also optimized for Phones & 7″ Tablets, like the Nexus 7. Manage your money and see if you are Guilty of spending it where you shouldn’t! It should hit the Playstore today. If you liked one of our apps and wish to buy us a cup of coffee, go ahead. And thanks!